With a concrete plan to offer excellence in techno education and to meet the present and future status of industrial growth, the academicians and integellicia of Vidya Sagar Charitable Trust formed KIST in the year 2001. Konark Institute of Science & Technology is approved by the All India Council for Technical Education (AICTE) and is affiliated to the Biju Patnaik University of Technology (BPUT) Rourkela. This is the first venture of the Hi-Tech Group of Educational Institutions. Placements : The institute has its own placement cell named as Industry – Institute -Interaction Cell (I3-cell) headed by an experienced Professor.The I3 cell at KIST imparts high-end training to transform students into outstanding personalities who become intuitive,decisive,knowledgeable and responsible leaders with creativity, objectivity, integrity and ethical values. The students learn more outside the class room and blossom even in top market conditions with intensive Training imparted from 1st year itself. The Campus Recruitment Programme is a standing testimonial to this fact with a plethora of offers across IT & ITES, Telecom, Automobiles, Cement Industry and Consulting sectors. A host of new recruiters were the highlight of the recruitment program, reaffirming the faith of corporate world in talent of I3 – Cell, KIST. 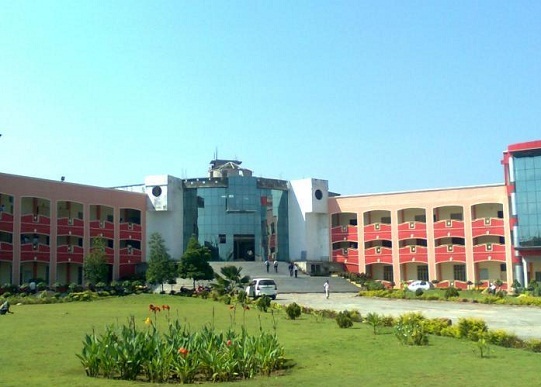 Campus: With a concrete plan to offer excellence in techno education and to meet the present and future status of industrial growth, the academicians and integellicia of Vidya Sagar Charitable Trust formed KIST in the year 2001. Konark Institute of Science & Technology is approved by the All India Council for Technical Education (AICTE) and is affiliated to the Biju Patnaik University of Technology (BPUT) Rourkela. This is the first venture of the Hi-Tech Group of Educational Institutions. With a sprawling campus of 35 acres, the college is located at Jatni in a lush green atmosphere away from the bustle of the crowded city life.The glittering buildings of the college are beautified with appropriate avenue plants, amusement parks, yoga centre,playground etc.Not to mention ,the well equipped laboratories,classrooms and a well -stocked library which are the hall mark of excellence in education which are all in place. KIST provides quality techno education in a highly disciplined environment at par with international standards special emphasis is given on development of students to empower them to stand up to the challange of the present employment market of the world. Central library: Air conditioned library greets the stuents with about 20,000 volumes,60 journals and many news papers and magazines .The institute follows the policy of obtaining multiple copies of the most of the titles to extensively cater to the needs of the students. Besides a photocopying machine is available in the library for use.The central library is well equipped with modern facilities and resources in the forms of CD-ROMs, online databases, books, journals, magazines. It has also developed a full-fledged digital library equipped with necessary modern equipments in order to provide various digital mode library services. The library services has been fully automated using the commercial library database management software “LIBSYS”. The central library is the member of INDEST-AICTE Consortium, provide online access to many important e journals about 294 nos of IEEE and ASME. The library is the members of DELNET for Inter Library Loan facilites. The central library has license NPTEL(Natonal Programme on Technology Enhanced Learning) for providing 130 nos Video courses Of all IIT and IISC professor’s teaching of all subjects through LAN. Hostel: The quality of hostel is an essential part of the academic success.KIST provides National standard on-campus separate hostels for both boys and girls with excellent amenities for confortable living of the students.KIST follows a system to provide lodging and boarding to all the students.Students will be alloted accomodation on first-come-first-serve basis. KIST has its 300 seated boys hostel and 200 seated girls hostel on-campus. The hostels are provided with 24 hour water supply, uninterrupted power supply, internet facilities, TV, Telephone, Refrigerator, Aquaguard, Magazines, Newspapers, indoor games and fast-aid facilty for the students. The hostel also has a 24/7 common room, library and reading room where the students can interact with each other which is very much essential for professional education. Food in the hostel is served in the mess. Both non-vegetarian & vegetarian food is available on the basis of requirement of the students. Good hygienic condition is strictly maintained both in the food and living conditions.Hostel superintendents supervise the functioning of the Hostels regularly. The hostel fees are as per the guidelines of the state Govt. of Orissa.